Posted by Des at 3/24/2006 03:53:00 p.m. It's GENIUS! I always knew those folks in Mahon Point were up to something, hiring as they do from the cream of mensa Ireland. Nappies next to milk, it's the stuff of einstein! What else would you think of when buying something which will undoubtably get showered in human waste except a huge helping of your favorite cereal drizzled lovingly in fresh room-temperature milk. What a cunning marketing ploy. That reminds me, I must get some milk. and nappies. Actually the milk was mine ! 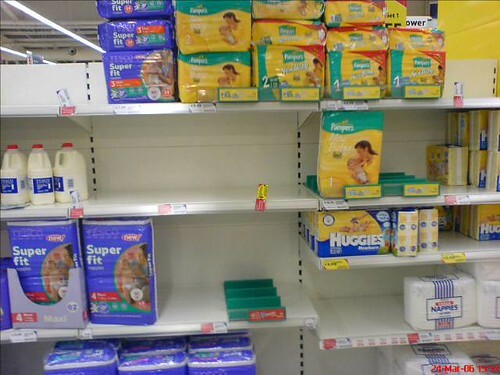 I was commenting on the fact that on a friday evening a supposedly competent Supermarket chain had empty shelves where nappies should be. Of course with Tescos usual sheer intelligence they decided that it would be a good time to re-arrange other aisles as well so the place had quite a large number of empty shelves on what is a traditionally busy day of the week. They is many reasons for theses gaps, New layout plan, new lines not in yet, missing delivery, not available from supplier. Or just plain old incompetence..
Well you must be hard up for something to do if this is all you have to do! Kavin Cook 10/17/2017 04:43:00 p.m.